Pass the Cereal: Who Loves Owls? Remember this Work-in-Progress? 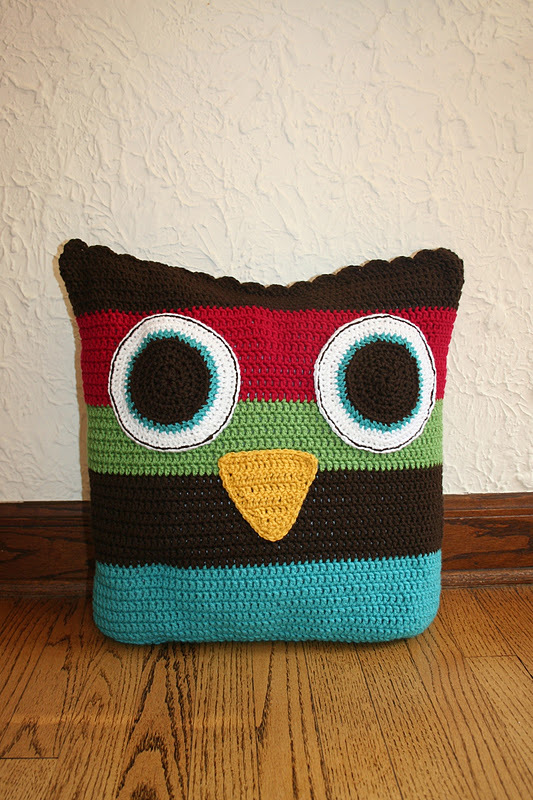 Back then it looked a lot like a bag, but it turned into this little owl pillow. The pattern is from the book Little Crochet by Linda Permann, but I spied it originally on Pinterest. I didn't stray far from the original color scheme, but added a little magenta to brighten it up. The only issue I had with the pattern was the size. When I started the base, it seemed much too small, as I had intended it to be a comfy pillow to lean on while reading. I ripped it apart and doubled the pattern, but after 5 rows realized it might end up body pillow-size and would take a long time to finish. So I ripped it apart once more and followed the pattern as written. 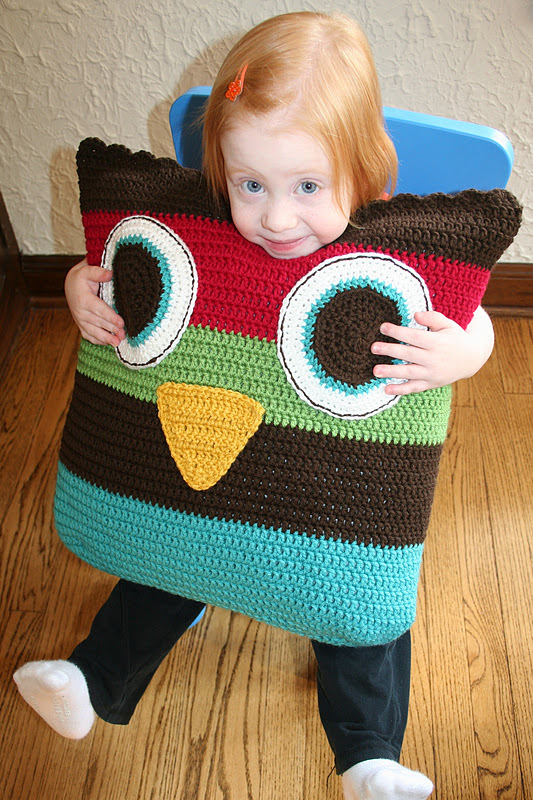 As you can see, it came out just right (although Livie was not happy that the owl was flying off to a new home)! Super cute! Birthday present for Wynt? Heather! That pillow is so great! Perfect and I love the added pop of color! She will LOVE it! It turned out so so cute! Live is hold it pretty tight, might be kinda of hard convince her to let go. Awwww! Yours is SO much cuter than the original. Love it! And it looks like I'm not the only one. You may have to hook up another one pretty soon! Well done, but I think Paula's right, looks like you might need to make another one soon. 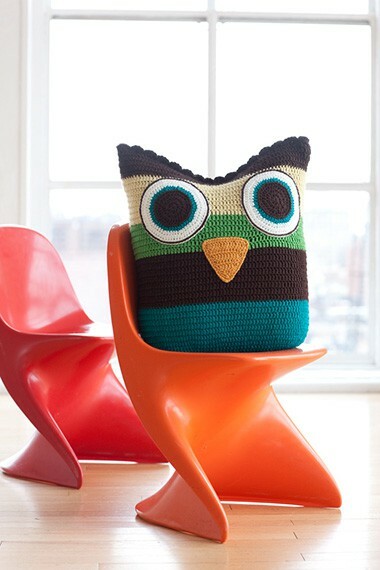 Your owl pillow is gorgeous. Love those big eyes and the colours you have used. 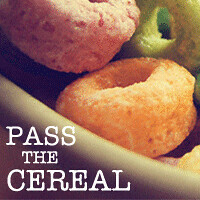 Thanks for visiting my blog and your lovely comments. Yes, the mystery is a snowman - I like to try and stay cool when things heat up around here. So far we have only had a couple of hot days but Summer just started! The miniature is completed too - another snowman. That pillow is awesome! Love the bright colors! wow! now I want to start another with red at the top...looks so bright!! Mine has also gone on a plane to a new home!